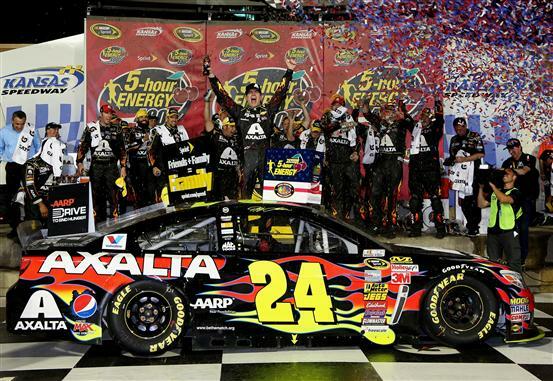 KANSAS CITY, Kan. – Jeff Gordon held off Kevin Harvick over the final laps and went on to win the 5-Hour Energy 400 Sprint Cup Series race at Kansas Speedway on Saturday night. The victory was by .112 seconds and was the first of the year for the four-time champion and his third at Kansas Speedway. The win for Gordon was his first since Martinsville Speedway last fall and it earned him a place in the record book as the first winner of a night race at the track. Make that “another place” in the book as he won the first-ever Sprint Cup race at Kansas Speedway back in 2001. By winning, Gordon, who started the race leading the series in points, virtually assured himself a spot in the season-ending Chase for the NASCAR Sprint Cup. Harvick finished second after leading the most laps – 119 – in the race and making an impressive charge to Gordon’s rear bumper on the final lap. “Just ran out of laps at the end,” Harvick said. “I was looking at the fuel pressure gauge instead of the tach and lost a bunch of time down pit road and off of pit road and wound up getting stuck behind the 24 (Gordon),” Harvick said. Kasey Kahne, Gordon’s teammate at Hendrick Motorsports, finished third while Joey Logano was fourth. Fifth was a third Hendrick driver, Dale Earnhardt Jr.
A slow pit stop during a caution that occurred on Lap 177 knocked her back to seventh but again, she hung tough and notched the best finish of her 57-start Sprint Cup career. However, the night went bad for Harvick when a spin by Marcos Ambrose on Lap 110 produced a caution. Harvick had pitted as the leader six laps earlier while most of the rest of the field did not. That put him a lap off the pace. He did get the free pass but when the race went green, but was outside of the top 15. Harvick was not done, however. He slowly worked his way back forward and on a restart on Lap 195, climbed to third place. On a restart on lap 207, he restarted second, below leader Joey Logano, and moved back to the lead between Turns 3 and 4. Asked if running out of gas heading into the pits cost him the victory, Harvick said, “I can’t say that. I mean, even though it was out of gas, with these EFI (electronic fuel injection) units, it still runs and I should have been paying attention to my pit road speed lights and should have gotten off pit road better. Hopes for a victory on what he considers his home track were crushed for Springfield, Mo.’s Jamie McMurray after his car blew a tire, broke an oil line and burst into flames early in the race. The start of the race was pushed back not by rain, but by lightning. It was not until after the cars had moved out onto the track for the parade laps that rain began to fall. But that was very light, quickly evaporated on the warm asphalt and the race was started after a 35-minute delay.